Monday’s Telegraph published the economic part of their monthly YouGov poll (it also had the best Prime Minister question, which gave David Cameron a 4 point lead over Brown). Reports of economic questions in polls are always a bit lacking. They inevitably show that everyone thinks we are headed for hell in a handbasket (if they don’t, the papers don’t bother emphasising them), and findings like 56% of people think the economy are reported without much context at all. Is that really bad historically, or are we just a doom-laden bunch of miseries convinced that we’re doomed anyway. The Telegraph article does give a bit of context, it says they’re the worst figures since 1994, but since YouGov has only been polling since 2001 or so that comparison itself raises questions (presumably they are comparing to Gallup, the Telegraph’s old pollsters, which is a poor show). Looking at YouGov’s question on whether people think the Economic will get better or worse, this month 56% of people thought it would get worse, with only 17% expecting it to improve – a net score (the so-called “feel good factor”) of minus 39. This is indeed the lowest YouGov have registered since they began the tracker in 2003. Looking at the graph below you can see the lines look pretty consistent until September 2007, the month of the Northern Rock collapse. Since then they have been trending negatively. I make no judgement about what state the economy is actually in, but since September the public have clearly been more and more convinced that it’s in trouble. But what about some context? They may be the worst figures since YouGov began tracking in 2003, but those 5 years have been pretty benign economically. To go back further, lets look at the same question from MORI, who have trackers going all the way back to 1979. Ipsos MORI’s most recent figures showed 55% expected things to get worse, with only 9% expecting an improvement – a feel good factor of minus 46 – and here’s the graph showing the historical figures. This doesn’t give much comfort to the government. As you can see, people do in general tend to be pretty pessimistic. There are a couple of points where there is a net positive rating (after the 1997 Labour landslide or the 1987 Tory victory, for example) but most of the time we’re comparing different extremes of pessimism. There are recent drops to compare to current figures – the rating was worse than it is now as recently as February 2003 (the impending war in Iraq perhaps? ), it hit what really was the lowest rating since 1979 after September 11th 2001. There is another dip in 1998 that I can’t think of an obvious explanation for. After Black Wednesday in 1992 the net figure was down to -46, the same as it is now and in the dog-days of the end of the Thatcher government in summer 1990 it had descended to a similar level. Before that you need to go back to 1979 – whatever economic turmoil and recessions there were in the early 80s, people were more optimistic about the economy than they are now. 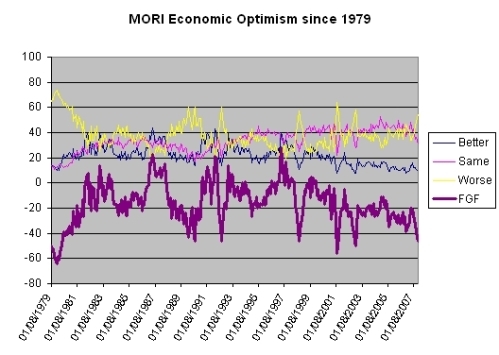 For the majority of the time the figures vary between 0 and minus 30, it normally drops below that score only for brief extreme reactions to unusual events (often non-economic ones that have just shook confidence in general) – the only real exceptions are way back in 1979, the end of Thatcher, and the last year or two when it has sunk below that figure several times. 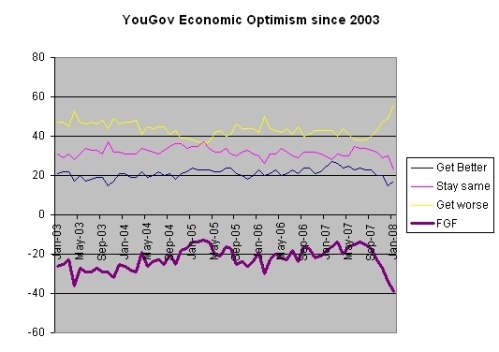 Compared to ratings in the past, economic optimism really is very low indeed – perhaps even irrationally so. Still, I’m not an economist and I don’t pretend to know what state the economy is actually in, but in terms of public perception things are very bleak indeed. One getout clause for the government on this is that people do not necessarily blame a poor economic outlook on the government. Populus ask a semi-regular question on whether people think the economy is doing well, and whether or not that is attributable to Gordon Brown. The last time I can find it is back in December 2006, when they found 51% though the economy was doing well, and 40% thought it was doing badly. 47% thought the state of the economy was due to Brown, 44% thought it wasn’t much to do with him. It maybe that the public with accept that harder economic times are due to the world economy, and not pin any blame on the government of the day. On one level I am sure that’s the case, but on another level I suspect it doesn’t matter. My guess is that hard times will gradually sap support for the government of the day across the board, even if people do not directly blame the government for specific economic problems. are all too happy to take the praise for the good times but I’m very afraid they also have to take the fall when the bad times arrive, even when the case of it is outside their control. I still think we could have a recession – even a month ago most economic forcasters thought the UK would avoid a recession but now some seem to be actively predicting it. Obviously a recession hurts the incumbent Government in the polls. They have to hope its not as bad as feared or doesn’t last for too long. No chance of an election this year or next in my humble opinion because of the economic outlook. An economic slowdown is inevitable, but a recession is, in my opinion, quite unlikely. However, if public confidence is this bad, they themselves could tip that balance. This brings June in. If ministers are charged over electoral irregularities there may be a moral case for an electoral mandate to be sought by Rusty McBean. With Labour already back-tracking on the Commons debate over Europe – now 12 days not the 20 promised – the EU Constitutional Treaty process already lacks moral authority. Would McStalin really call an election on his own bat this year…? Then one must consider what may await in 2009. Nominal house-prices are expected to be 13% lower, to which will be added an average RPI of 3.5%+. Will home-owners consider a short-term (2-year) paper-loss of 20%+ in equity their fault, or balme the government [sic]? Economically Rusty is a busted-flush, and without the economy what has McBean’s claim-to-power? Most respected analysts are confident that there will not be a recession; the underlying economy is quite robust. The party that knows most about recessions is currently in opposition. What is disappointing for the Conservatives – and should be sobering for them – is that Cameron is only 4 points ahead in the PM stakes. And that after a very bad press for the government. Remember the huge lead of Blair at an eqivalent juncture in the mid-nineties. What I find most interesting is that although there are regular up and downs, people are just consistently pesimistic. I also get the impression, although I would be interested to see some data, that although people tend to predict bad things for the future, they also tend to think that the last year was good for them, and I suspect most will say the same in a years time..
I’m not sure what his means, but I suspect that the constant diet of national self deprication in the press may have something to do with it. But maybe that’s just me! JohnH, how can you state the economy is robust? I ask purely from an economical point of view. Prior to Northern Rock the UK had a PSBR of -3.4%/GDP. More worryingly the Capital Account deficit has know ballooned to -3.4%/GDP. [Source: The Economist, Market Indicators.] So the UK economy is, in effect borrowing 6.8% of it’s expenditure whilst “generating” a growth rate of 2.8% (2007 expected growth). As the equity-effect has yet to hit the consumer, and inflation is kept high on the devaluation of the pound (as the Bank of England try to rebalance growth against prices), what evidence have you of a healthy economy? In the last quarter recorded (2007 Q3) Britain lost $40billion of invisibles. What safety-net has Rusty left us from meltdown? Fluffy-I urge caution in using words like “moral case” after the Conway news. There is a prima facie case here of theft of public money. I was beginning to think that the deafening silence from Westminster confirms what one suspects-they are all at it with their Parliamentary Allowances.So I am pleased to see a Lib Dem MP wanting to take it further. I think the public have shrugged a cynical shoulder over party funding transgressions-but have every right to be very angry about this-which in my view is much much worse.For the moment it’s only a Conservative MP in the frame….so invoking moral cases just now might be inadvisable. You asked JohnH how he could state that the economy is robust… but unfortunately there are two of us with confusingly similar usernames – and it was the “other one”, John H, who said that. On this occasion I agree with him entirely. There are rather more turbulent times ahead than for most of the last ten years, but few experts are predicting disaster, or even a full recession, for the UK economy. And the impact on the electorate (especially as far ahead as a 2009 election) is unpredictable – except by those carried away with wishful thinking that Brown is finished. Maybe he is only just getting into his stride? It remains to be seen whether we have a recession or not.A fall to sub 2% growth is still not a recession. I wonder too where & how the effects of a recession would be felt in our strange unbalanced economy.Presumably it would be felt where growth currently occurs-ie the South East-no lost votes for Labour there.Also since most new jobs have gone to immigrants -will they not just go back home? In those many areas where the “economy” substantially consists of The State & it’s expenditure presumably there will be little or no effect felt-unless & until Public Spending is cutailed. And it is here that Brown is between a Rock & a hard place.Our Public finances are chronic-the worst deficit proportionatly in EU.OECD put our structural position at 20th out of 27-down from 6th in 2001. Andrew Neil this morning asked Patricia Hewit what our equivalent of Bush’s anti-recessionary measures in US would be ( seventy five basis points drop & multi Bn. $ Fiscal injection).There was no answer because Brown hasn’t got one.BoE are fighting inflation & so major rate cuts are problematical. Brown has no room for Fiscal relaxation-indeed Robert Chote of IFS says a tightening is needed. It’s back to tax increases or public spending reductions again-not a pretty sight for GB.How will the master of monetary manipulation pull it off this time? Totally agree with your analysis Colin. I look forward to the spring Budget with interest. How’s Darling going to dress up public spending cuts or more tax increases to make them palatable for the general public ? I imagine there’ll be another rate cut or two , inflation will continue to appear low, unemployment low – possibly rising but not dangerously so. The employment of people in the public sector has fallen in recent years, and most new jobs are in the private sector – it is those jobs which are more at risk than the “army” of state workers, though I don’t suppose there’ll be outrage on the streets if a few more thousand public service staff get fired. I imagine recession will be felt most keenly by those who lose their jobs and/or homes. Those figures are likely to rise, but by how many before the Govt gets blamed as much as previous Governments? If I lose my job or home, I hope I’ll shoulder part of the responsibility myself. If I hang on to them, I certainly won’t be thanking the govt. The public haven’t been conspicuously on the march ini support of the police, secondary picketing has gone, and I reckon most people simply shrug and get on with it rather than feeling anger. “Appear” being the operative word! How many people do you know who think inflation is 2%?. Inflation for people whose domestic budgets are largely expended on Food, Energy & Council Tax ( not in the CPI index!) may be coping with 7% inflation.This is true for Pensioners,& Families on low incomes particularly. If I hear Brown say UK inflation is 2% many more times I will throw up. I wonder if the CPI target that BoE are aiming at will lead them to underestimate the real level of inflation, which many people think is more correctly reflected by RPI-ie 4% plus. Hi Colin. I know what you are saying, but to be honest it might be a good thing that enegy is more expensive, as it might make people think about their energy use a bit more. We spend far less on energy now that 30 years ago and we have all become used to the idea that energy is easy to come by! (By ‘us’ I don;t just mean the UK, but the West in general). However, for those who are struggling to stay warm, I understand that this might sound a but rich..
Colin – That’s why I used the word! Sorry, but one must correct you. A recession is defined as two consecutive quarters of negative growth. This sit easily with a predicted growth rate of 1.8 – 1.9%. Scenario: Q1: -0.1, Q2: – 0.3, Q3: 1.0, Q4: 1.25%. Ergo recession in first half of the year. As anyone who has watched the forecasts published monthly in “The Economist” (i.e. anyone without a proper life like oneself), forecasting has a habit of trailing reality, and is prone to errors (hence The Economist publishes the range of predictions). That scenario means there was recession and then recovery. Forecasts don’t really have any relevance. If a quarter’s growth were measured as negative, then the next one too, people would legitimately think there was a recession; however, there would be an argument then about depth – and in your scenario the decline would not be significant enough to affect public perception. Colin is right in that a recession cannot be called until it has occurred. Quarterly figures, not annual ones. Thanks Fluffy-I accept your point in principle but I must say I hadn’t envisaged a recession lasting only six months followed by six months growth at the end of which ( on your figures) the economy is growing at an annual rate of 5%. Have we ever had a recession with such a profile? He just said it in PMQs – hope you haven’t had lunch yet! He mentioned it in contrast to our competitors (ie we’re at up to half their level) If a different internationally consistent measure produced a figure of 4% for us,(and therefor 6-8% for those other countries) then the (bank’s)achievement in UK inflation control would appear to be even better. The “appearance” is important because the measure is, as you no doubt would point out, used in pay and benefit settlements. A 4% increase in public sector pay would certainly be inflationary, on any measure. No-I delayed my lunch till after PMQs-have run out of sick bags! Yes I understand your point about international comparisons….but like many people I suspect-I’m more interested in what’s happening to prices in UK.And I just don’t believe that 2% represents the cost increases being faced by ordinary people on their domestic budgets. For many retired people ( like me) Council Tax is a major element of household costs-and that has increased in excess of inflation throughout this Government’s period in office-so yes I’m in favour of avoiding inflationery pressure in public sector pay-but if that’s what we are doing, how come Council Tax has increased by so much in real terms? Just as a footnote part of the answer is in fact public sector pension costs. This I believe is a Time Bomb waiting to explode.It will when there are no more Private Sector indexed, earnings related pension schemes left-and the public become aware that they only do exist in the Public Sector-as a result of which we are paying more for their pension rights than we are for our own…but that’s another subject! Colin – Fair comment – I have no idea why CT goes up by so much more than CPI every single year, and I also expect to retire much later than I would had the “time bomb” not started vibrating! Colin – Your point about public sector pensions is interesting and one I’ve spent some time researching. I could write a lot on this subject. But for now I’ll leave you with some interesting facts. Estimated future liability from public sector pensions is now about 1 Trillion. The Government makes no provision for this. On average 26% of every council tax bill is to pay for Local Governement pension contributions. Civil Service pensioners are index linked to rpi not cpi. So the situation currently is civil servants are getting increases below cpi(2%) whilst civil service pensioners are getting rpi(4%) so are getting much better inflation linked rises. I could write a book on this – it’s a ticking timebomb I agree. Surely Local Boroughs or councils pay pensions out of their own pension funds,dedicated to the purpose, don’t they? There’s nothing in my CT breakdown to suggest I have to contribute to the pensions of retired council employees. Sorry KTL, I think you’re saying that the wage costs element of CT includes employer pension contributions, which explains the extrapolating increases. Seems jolly high to me, but I appreciate the facts you give. Thanks indeed.The LA pension cost within Council Tax is truly staggering. Yes it’s the fact that these promises are unfunded which is the financial time bomb. That they are promises the Private Sector can no longer afford to make just excacerbates the gulf with the Public Sector. Peter Oborne wrote recently about the rise of a political class , who are largely unnaccountable for the privileges they award themselves.I agree with him-and the recent Conway case is but a small example. One only has to see the problems in France as Sarkozy tries to roll back decades of unaffordable & unjustified Public Sector privilege, to see what can happen. It would take a very very brave politician to grasp this nettle but it would surely be a vote winner. Unlike civil service pensions and NHS pensions.-The local government scheme is a funded scheme. But the employers contributions into the scheme of course come from council tax. So JohnTT, your council tax doesn’t go direct to retired LG workers but it does go to fund their pensions for when they retire. Indeed even with all the rumblings about public sector pensions and final salary schemes in general. The Local Government pension scheme was actually made even more generous last year. What world do these people live in.? Yes 26% is a truly staggering figure and is one reason why Council Tax keeps going up more than inflation. But which Government is going to have the balls to tackle this problem and the inevitable huge fight with the unions ? Labor never will and Tories have never mentioned it as amjor issue. Public Sector Pensions funded from the Central Government Pot currently cost about 13BN a year although this is forecast to rise sharply – possibly up to 40BN a year in the next 10 years. This will hit a peak in about 2050. The Government has a roghly 1 Trillion future liability (Expanding at 50BN a year) because of the increased size of public sector plus increased life expectancy. The Government does not/ will not write this future liability into its books ie onto the national debt as it would break all its fiscal rules. Actually the whole issue should have probably been tackled 20 years ago during Thatcher’s time when it should have been apparent that people were living a lot longer and these schemes were no longer affordable. It doesn’t surprise me that Labour hasn’t tackled it as the Public Sector (In general) are Labour’s core voters. It’s frightening -unless you are on the gravy train. As someone who oversees the Highland Councils pension fund, which stands at about £800m or so, it’s made up of about 6% from employees and 16% from employers and in that respect isn’t that different from an company final salary pension scheme. Pension contributions aren’t a major cause of CT rises although when the stock market slows contributions may need to rise as returns fall. At the moment there is a review underway in Scotland and it looks like some of the benefits will be reduced and contributions need to rise. A lot of the pressure on Public sector pensions comes from people in the private sector who have either seen their final salary schemes wound up or benefits cut or those who have private pensions which due to stock market falls arn’t going to get what they want. That’s the politics of greed or in this case envy… It’s like saying…. “I am not going to get what I thought because of my own or my employers decisions, so other people should have their benefits cut so that they lose out too”. I have huge sympathy with people who have lost pensions or suffered because of the fall in pension benefits but I don’t think that is a good reason to reduce the pensions of other people. The reason that the CT goes up by so much tends to be gearing. A council starts with 100% budget made up 20% Local and 80% central. If the Council receives a 2% rise on the 80% it gets in direct grant, when inflation is 2.5%, then to stand still it would need to fund 102.5% with 81.6% from the government . That leaves 20.9% to find, which means the council tax has to rise from 20% to almost 21%, which is a 5% rise in CT to meet 2.5% inflation. Councils aren’t perfect and mine, which is one of the better ones, drives me crazy even at the best of times, but the main reason for CT rises in below inflation rises in central grant and new responsibilities that aren’t properly funded. But then in Scotland we aren’t going to have CT rises for the next few years…………….. I think Peter’s analysis works better for me. Since Gordon Brown said he had abolished economic cycles – they were all a Tory invention, I don’t see how he can now re -invent them. Some of us self employed rely on their own private sector pensions and as such, talk of pensions is seriously depressing. People like us will be forced to work until they are 70/75 so that our public sector friends can retire at 60. There will be riots in the streets – with bungalows, obviously. the current gold price is between 900&915$ for a troy oz, this means that if and when we need gold to get out of problems with the stock market or any other problems like house price fall which damage the stable economey, along with intrest rates and inflation, we will only get 75% of the value or their abouts (tell me if i’m not right)of what the gold would have been worth if it had been all sold off at the time i.e when gorden sold half of it when he was in the counting house, but on the brighter side an intrest rate cut is likely at the BOE’s next meeting maybe 0.25% or 0.5% cut to help the economey move back into third or forth gear. Stuart G – I would have thought an Interest rate cut in Feb is inevitable with more to follow. UK normally follows US to some extent in economic cycles and the US FED are slashing rates dramatically. The problem in the UK of course is that the brief of the BOE is also to keep inflation under control which is a very fine balancing act. Personally I think the inflation target is too low at this point in the economic cycle. If the inflation target was 3% – still low historically – then the BOE would have much more room for manoeuvre. Sally C – I’m like you, self employed with a private sector pension and resigned to working until I drop. However its not jealousy that makes me write about public sector pensions but a real concern as to where the money is going to come from to fund these schemes in the longer term. This is something that some party or politican is going to have to take a serious stance on. Eventually these schemes are either going to have to be killed off or benefits cut substantially for example, average salary instead of final salary or perhaps half final salary instead of 2/3 final salary etc. Thanks for accepting my contrived point. Of course this is speculation. As the last quarter 2007Q4 should annualised growth of 2.6% I’d probably look at growth slowing/declining in 2008Q2/3. One interesting factor could be oil prices. [No, let’s not argue along the England/Scotland lines, but keep to economics.] Say that Oil accounted for 3% of GDP in 2007 with an average price of $90/bbl. With demand falling outside of Asia, would a fall to an average of $81/bbl lead to a fall of 0.3% of GDP (given constant production levels)? Given slower growth in public services, a credit-crunch, and a softening consumer-sector could oil be the deciding factor in whether we have a recession or not? Maybe someone with a better knowledge of the oil-economy could help? The sustainability of Public sector pensions is a big concern and something that is being addressed all be it slowly. What the actuaries try to do is predict what is needed and then make recommendations that will see contributions rise in a gradual controlled way over a number of years to meet future need. The main driver is demographic, when people started work at 15 and left at 65 to die at 70, then it was 50 years work for 5 years retirement, for every ten years you contributed you were paid for one. All else being equal to have a pension equal to your final salary you needed to put away a tenth a year ( I know that’s very simplified). Now people start at 20 leave at 60 and live to 80, 40 years work for 20 years retirement , that’s only 2 to 1, so using the same simple model to retire on final salary you would need to put away half your wages. Everyone public or private is going to need to put away more for longer and accept less in the end. In many respects the Government hasn’t had the courage to face up to this ( nor the opposition) and what has been done is short of what is needed, but there are signs that we are starting to move in the right direction. The important thing is that we build up public acceptance of the need for these changes and then introduce them gradually but in time. What would be good for no one is that we do nothing till it’s to late and then have a crisis. Having said that I have my doubts because as I have said before Britain just doesn’t seem able to do long term strategic planning. KTL-Yes I agree with you-the Public Sector largesse which now abounds is unaffordable, and as Sally says, if it continues the public will decide they are no longer willing to pay for it. One only has to think of two people contemplating retirement right now-one in the Private sector & one in the Public sector.The former whose employer has transferred the risk of pension fund returns to him, contemplates falling share prices with his money purchase pot.The latter , whose employer hasn’t even funded the pension he now looks forward to,contemplates a salary linked pension with indexation. It isn’t jealousy which will make the former wonder how the State can possibly impose the cost of it’s pension promises, on him, when the wealth generating sector of the economy has decided those risks are unaffordable. “… It is of course quite normal that wages should increase above the rate of inflation in a growing economy, and, over time, we would expect more people to earn £50,000 and above. But the increase in the number of local authority employees being paid more than £50,000 per annum has been phenomenal, far outstripping the rate of increase in the economy as a whole. The average local authority is employing over nine times as many people on £50,000-plus packages as ten years ago – 66 people in 2006-07 compared with 20 people in 2001-02 and 7 people in 1996-97. The average local authority spent over £4 million employing people on £50,000-plus remuneration packages last year. The total bill for council middle and senior managers on £50,000-plus remuneration packages was almost £2 billion last year almost £1 in every £11 of total council tax revenues. ..and of course all those well paid jobs attract generous pension rights. The problem with the interest rate cuts issue is that it only gets the economy moving by making it cheaper to borrow or by freeing up money by cutting the cost of servicing existing debt. In effect the solution currently being offered to deal with the problem of the unsustainable levels of debt that we now struggle to service is ….More debt. It’s like stepping on the accelerator on an icy road when you starts kidding towards a brick wall. What we need is actual a period of low growth and slowly falling house prices that will let is gradually wean the economy away from expansion driven by consumer spending paid by debt. Problem is we are now so indebted that that slow growth in itself would hurt so much that it would probably turn into a crisis. As someone who has been warning about this for years I don’t take any pleasure in seeing it arrive, but I don’t think we should pretend that a cut in interest rates is the solution. Commenting on the perceived costs of the break-up of the Union hosted by Auntie Beeb, one made the bold suggestion that England should assume all government debt in return for maintaining all heavy equipment within Her Majesty’s Armed Forces. I don’t know if anyone responded to my suggestion. Why would an English nationalist be so generous to his Scottish cousins? Simple, one knows that one-in-three jobs in Scotland is public-sector. Add to which they have so many politicians. Scotland would have to pick up the pension liabilities. So by assuming all our liabilities now, we English do not have to worry about the Scottish public-sector pension time-bomb in the future. One smiles in the knowledge of this…! P.S. A point I failed to make on said blog was the fate of the BBC. It’s assets need not be split between the two kingdoms: Scotland can have, as we say down sarf’, lock, stock, and barrel. The Institute For Fiscal Studies’ Green Budget has a section on Public Sector pay & pensions. Well Fluffy, I’d be delighted to take you up on that offer. You keeping the heavy stuff and the debt is fine with us. If fact I’ll even put it forward as SNP policy. It is without doubt the best idea you have ever had….. The trouble is Peter it could already be too late. Its difficult to change people’s pension rights when you have alreeady made them a promise, particularly in the public sector. It could be years before these reforms happen, if they happen, and public sector unions won’t accept the situation without a heck of a fight. Well to be honest I am tempted to go for the Irish option, just fit bigger aerials and keep watching the Beeb, pretty good quality and no cost. Joking aside we will have some kind of broadcasting system though I don’t know what it will be. At the end of the day it will be for the first post Independence Scottish government to decide and although it may be SNP lead and I hope it is, we might not be part of it. For what it’s worth I personally prefer a commissioning regulator that either handed cash to Tv companies for certain types of programme or laid down rules on how much “Public Service” output they had to produce and regulated quality. I just feel it could give us the same or better at lower cost. As to funding i think we should at least explore “Channel charging” something like a £20 fee pus £5 a channel. So if you have BBC 1&2, ITV, Ch4 and Ch5, it’s £40 but if you have the full Sky package of 100 channels then it’s £520. That way the public would vote with there wallets and I thing a lot of the crap that multi channel TV has brought with it would soon fade. It’s all very well if you get a dozen shopping channels you never watch free for your £25 a month from Sky+, but how many people would pay £60 a year for the privilege. But like I say these are my thoughts… Not SNP policy. “Well to be honest I am tempted to go for the Irish option, just fit bigger aerials and keep watching the Beeb, pretty good quality and no cost. Two interesting comments – firstly you’re saying that an independent Scotland would use former British TV as a medium and for free – perhaps you are admitting to Scotland being unable to produce a decent media along with other things that you are dependant on!! Secondly you refer to an independent Scotland again !! You’ve got to wake up and smell the coffee – it is’nt going to happen in yours or my lifetime – the Scots are too dependent on the Union – your party is fighting a LONE battle – the only winners in Scottish independence would be England financially . We in England would benefit from no more Labour party wins in England and no more Scottish prime ministers like Blair and Brown – no more Liberal leaders like Campbell & Kennedy / lower taxes to help the English economy after stopping much needed aid to Scotland. Why don’t you declare UDI like the Rhodesians and now possibly Kosovo – it worked in Rhodesia for quite a while! The difference being that your cause is based on very little and theirs was based on necessity to survive !! Back to the thread after our little dalliance…. The represents the second of two paragraphs related to this article. Including the first paragraph would add more context (and gloom). [Backgrounders, Britain’s Economy.] Hopefully one has not broken copyright laws…! Sorry Anthony, things spun-out of thread due to the subject of the debate. How else could it be…? Does anyone read past threads…? Do we not just choose the current battlefield, and deploy our forces/resources accordingly…? Maybe YouGov should open a general comments thread, where an overall view of current affairs can be aired based upon current polling information. We could also build a collective [shudders] thread where we discuss etiquette…? Sorry my fault, but If asked a question relating to Independence, I sort of feel honour bound to give a reply. No our economy is not robust. Indeed, far from it. Initially, back in autumn 2007, I was of the view that we might just avoid a technical recession in 2008, but that the impact on disposable incomes for the majority of people would make it feel as if we were in one. Since consumer confidence depends more on perception than reality, we would to all intents be in recession. Sadly, I now fear that we will not only have a technical recession, but a full-blown one. The reasons for this are many-fold. DEBT:- the level of indebtedness in Britain is unprecedented. Most of the growth in the past decade has been debt-fuelled. While mortgage rates may fall (but not as fast as base rates) this easing of the pain is unlikely to apply to credit-cards and other unsecured debt. At the same time, access to new debt will be severely curtailed. Thus, not only will the cost of debt weigh down on households, funding new expenditure from debt will no longer be an easy option. Consumer spending will therefore fall. Trade imbalance:- it is shocking that Labour has allowed so much of our productive capacity to slip away as though it did not matter. We cannot carry on with such a massive trade deficit. Closing that gap will entail reducing consumption. The ticking pensions timebomb is now visible to most people who are even remotely economically literate. The rational response is to increase one’s savings ratio. Higher savings = lower consumption. The ratio of average house prices to average incomes is totally out of kilter. This has been unsustainable for years, but was kept afloat by cheap and abundant mortgage credit. The BoE may be able to keep credit cheap by cutting rates, but the banks have had a salutary shock and need to rebuild their balance sheets, so you can forget abundant for the next year or two. There will be a correction in house prices. On the basis of the last three corrections, it will be in the order of 30-50% in real terms. With inflation low, that means 25-45% in nominal terms. It does not require widespread repossessions for that fall to hit consumption. Firstly, the public finances are in a mess with Brown having run large budget deficits in a growing economy, so Darling now has no room for manoeuvre. Secondly, Brown allowed significant growth in the public-sector payroll which makes it difficult to cut back public spending quickly. Thirdly, as the economy slows, revenues will fall, but the existing dficits means that tax levels will have to rise, in turn reducing disposable income still further. Finally, Council Taxes will rise again from April – and well above the rate of inflation. As Peter Cairns has pointed out, much of this is down to Government imposing extra costs (including pension obligations) while holdiing down central grants. Historically, Governments tried to offset the downside effects of the economic cycle by boosting public expenditure – funded by budget surpluses during the “good” years. Perhaps believing his own claim to have abolished the economic cycle, Brown failed to build up the necesary war-chest, instead leaving the coffers empty – so that option is not open to Britain just as we face possibly the most adverse economic conjunction in decades. We can have a debate as to where the money went – but what is obvious is that we are not prepared for the coming recession. Can anybody show me where there is any “good” news on the economic horizon ?